The nature and magnitude of the growth in China-Africa economic relations in recent years is unprecedented and extraordinary. According to recent estimates, the value of China’s trade with African nations grew from a mere USD 10 million in the 1980s to USD 55 billion in 2006, and to more than USD 100 billion by the end of 2009, at which time nearly 1,600 Chinese companies were doing business in Africa with a direct stock investment of about USD 7.8 billion. The accelerating impetus of China-Africa trade has overtaken some crucially important features of an effective trade regime, most notably a fully trustworthy dispute resolution system. It is the current and potential future efficacy of such a system that is taken up in this book with great understanding and skill. The author evaluates existing mechanisms of dispute resolution in all aspects of China-Africa economic relations in light of the parties’ economic and cultural profiles and their evolving legal traditions, and goes on to propose a comprehensive institutional model of dispute resolution that takes full account of the economic needs and legal cultures of both China and the various African countries. harmonization initiatives—model laws, incoterms, restatements. The author includes in-depth analysis of how China-Africa economic relations fare in the varieties of dispute resolution methods available at the major arbitral European and American institutions—ICSID, AAA, ICC, LCIA, PCA—as well as under the rules of the China International Economic and Trade Arbitration Commission (CIETAC) and the important arbitral fora in Cairo, Kuala Lumpur, and Lagos. Endorsing institutional arbitration as the most appropriate form of resolving trade, investment, and commercial disputes arising between China and African countries, this ground-breaking analysis outlines the obstacles and shortcomings of the available means of dispute settlement, both in international and domestic contexts, and offers deeply informed recommendations for improvement of the existing system. 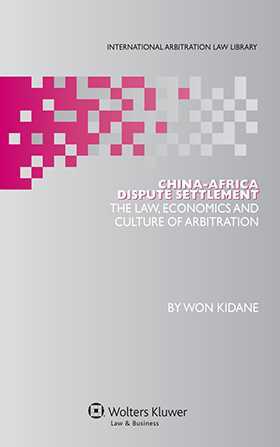 Although the book will be welcomed by interested scholars and practitioners for its detailed discussion of how China-Africa trade relations are situated within the global trade regime, its most enduring value lies in its thorough evaluation of the available options and its proposals for structuring a legal framework within which future disputes will be effectively resolved. Appendix 8 Chinese Arbitration Law. Table of Legislation and International Agreements.